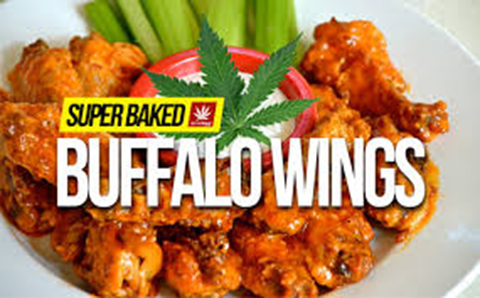 Super Baked Cannabis Buffalo Wings are on point for every stoner. A great addition for any party! The prep time is really only 15 minutes. 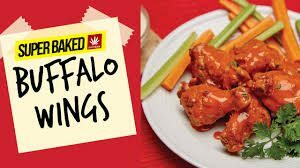 Cannabis Buffalo Wings do have to be refrigerated for at least one hour so the flou r coating gets firm before baking them. We like to prep them the night before and refrigerate them over night. If you like your wings really spicy you can always add more cayenne pepper to the dry mixture and/or use a spicier hot sauce. Enjoy! Squeeze and pat dry your thawed wings until you have them as dry as you can get them. Combine all of your dry ingredients (salt, garlic powder, cayenne pepper, onion powder, paprika, pepper, and flour) into a gallon sized sealable plastic bag. Once you have all the dry ingredients mixed in your plastic sealable bag add your wings, seal the bags, and toss until the wings are evenly coated with your flour mixture. Now place your coated wings on a cookie sheet, cover with plastic wrap or aluminum foil and refrigerate for a minimum of one hour. This step can be done the night before which is awesome! Once your wings have been chilling in the fridge and you’re ready to bake them preheat your oven to *425 degrees. Lightly grease a cookie sheet with olive oil or cooking spray and set aside. Melt a ½ cup of cannabis butter on low heat. Once your cannabis butter is melted turn heat off and whisk in ½ cup of hot sauce. Separate your hot sauce and cannabis butter mixture equally into 2 separate small bowls and set aside. Place your wings onto greased cookie sheet and bake in preheated oven for 25 minutes on one side. Flip them and bake for another 18-25 minutes. When wings are done remove from oven. Dredge wings in one of the sauce mixture in bowl and place on a new ungreased cookie sheet. Place wings in the still hot oven on broil for 5 minutes. Flip wings and broil for another 2-5 minutes. Remove wings and toss in the remaining cannabis hot wing sauce and serve immediately with your favorite dipping sauce.